Hoping to escape the devastation from her sister’s death and her parent’s sudden departure, Mel Whitlock accepts an invitation to the secret underground clubs of NYC. It doesn’t take her long to fall in love with the eclectic world and begin using “scents” the new alternative to street drugs. Mel’s club hopping leads to her abduction. She is taken to a place called the Orphanage where people are “hyped” into believing it is where they belong. The Leaders two very handsome boys Levi and Tobias and an androgynous looking woman named Violet, try to lure her into their subterranean world where all things considered taboo are accepted and encouraged. Mel’s resistance to become “hyped” alerts the leaders that she is the one Edmonda, the tea-leaf reading gypsy predicted would come. The girl one of the boys would die for. Two of the leaders will stop at nothing to “hype” Mel before she tries to destroy their underground Empire and one will do whatever it takes to protect her. The Underground is an 80,000 word YA suspense novel with sci-fi elements and series potential. I am a graduate of the Institute of Children’s Literature (Writing for Children and Preparing Your Manuscript for Publication courses). I placed runner-up in a monthly contest sponsored by the SCBWI. Publishing credits include LCCC Literary Magazine, All You Magazine, Stories for Children Magazine and AlienSkin Magazine. I have a story that will be published in the October release of Chicken Soup for the Soul and received payment from ABC studios for a story on “motherhood.” I am looking forward to becoming a published novelist and would appreciate your help. I follow you on twitter and enjoy reading your blog. I recently saw that you mentioned you are looking for YA novels with sci-fi elements and I’m hopeful this story will interest you. I look forward to hearing from you. Mel’s club hopping leads to her abduction. (this feels a bit off the cuff to me—maybe use some more active phrasing to expand on the stakes. Like, was she in the wrong place at the wrong time, or is someone targeting club hoppers and/or lost girls?) She is taken (passive phrasing) to a place (a home? A spaceship? A hobbit hole? Give us something to set the stage) called the Orphanage, where people are “hyped” into believing it is the only place where they belong. The Leaders, two very handsome boys named Levi and Tobias, and an androgynous looking woman named called Violet (btw, you’ve essentially ONLY told us what these rather important characters look like—I’d like to have a descriptor that tells us about their CHARACTER), try to lure her into their subterranean world--where all things considered taboo are accepted and encouraged. As it's written, this query gives us a glimpse of your story's worldbuilding and the stakes, but lacks any reason to connect (and therefore to care about) the characters. All you've told us about Mel is that she's had a hard time, and is resistant to "hyping"--and we don't even know if this is a physical resistance, or a moral/mental resistance. And all we know about the antagonists (and possible love interest) is how they look. If you want your query to stand out in the slush pile, it's absolutely crucial to make the reader not only want to know what happens next, but to NEED to follow the characters on their journey. You very likely have written characters that I would love to follow--but you're not giving them a chance to shine in this query. I think if you invest a little more time in nailing down your characters (and possibly adding some voice) in this query, you will be able to intrigue an agent into asking to see more. That's a query's job, after all! All the best with your querying endeavors and don't hesitate to ask for clarification if some of my comments are confusing. Thanks for stepping up and putting your query on Operation Awesome! In celebration of the release of my novel, Angus MacBain and The Island of Sleeping Kings--my publisher and I are having a magical 7 day giveaway! If the winner is in the United States: An eBook copy of Angus MacBain and The Island of Sleeping Kings and a swag pack that contains goodies like magnets, pens, pencils, stickers, a notebook, a stylist, a mystical bag of stones and map, and bookmarks. If winner is International: eBook copy of Angus MacBain and The Island of Sleeping Kings, bookmark, and a $5 Amazon gift card. For a list of blogs hosting the contest please visit Juniper Grove Book Solutions and enter today! September Mystery Agent Reveal and Winners! Our September Mystery Agent was . 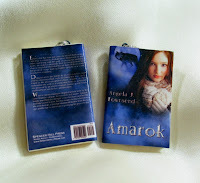 . .
KATHLEEN ZAKHAR OF HAROLD OBER ASSOCIATES INC.
Kathleen loves all things young adult and is also actively looking for adult science fiction, fantasy in all its varieties, historical fiction, and horror novels. 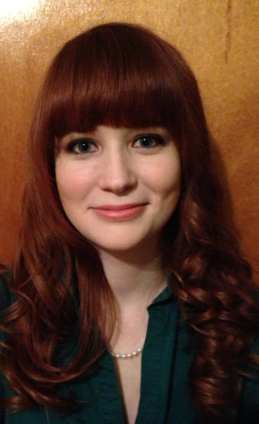 She enjoys quirky middle grade tales with captivating adventures and original voices, and will also accept picture books. Kathleen has a special place in her heart for sweeping love stories, magical realism, inventive world-building, repurposed folklore, dark comedy, and genre-bending novels. Winners can send their material to Kathleen@haroldober.com with Mystery Agent Winner and the title of their book in the subject line. OA: Care to weigh in on New Adult? Do you read it? Plan to represent it in the future? KZ: I’m excited about New Adult because it’s showing that publishing is truly a constantly shifting and evolving creature, but for now I’m watching the development closely and waiting for it to grow a bit more. A large portion of New Adult (at least that I’ve come across) feels like contemporary romance. While that’s great and there are tons of agents/editors/readers who want to get their hands on it, I’d love to see the genre branch out. My ideal New Adult project would be something along the lines of Lev Grossman’s The Magicians, where we have people in their late teens/early twenties in some wonderfully otherworldly environment acting their age with all the ensuing glorious messy mistakes and thought-provoking themes we’re already seeing in New Adult. OA: What are some great books you've read recently? KZ: I’m currently reading Wool by Hugh Howey and Saga by Brian K. Vaughan and Fiona Staples. As a passionate re-reader, I love to refresh my palate with some well-loved classics. Right now I’m falling back in love with Ella Enchanted by Gail Carson Levine, and I just finished Dogsbody by Diana Wynne Jones. OA: Your tweets establish your nerd-girl credentials nicely. :) What are some of your favorite TV shows lately? I have a Game of Thrones hand of the king pendant replica, which should tell you a lot about me. I wear it, and my nerd badge, proudly. I’m a huge fan of Doctor Who and absolutely can’t wait for the 50th Anniversary Special and for Peter Capaldi to breathe life into the twelfth incarnation of the Doctor. I’m also looking forward to the third season of American Horror Story and—my guilty pleasure—Downton Abbey. OA: Any exciting agency news to share? KZ: All of us at Harold Ober Associates are very, very excited about the upcoming adaptation of Lois Lowry’s classic dystopian novel, The Giver. It occupies such a special and laudable place in children’s literature and I can’t wait to see it on the big screen. I’m particularly thrilled about Tamora Pierce’s new novel Battle Magic. We’re still basking in the glow of Gatsby fever what with the wonderful movie and the recent audiobook. Seriously, if you haven’t listened to Jake Gyllenhaal say “old sport” a couple dozen times then you haven’t really lived. Because there’s just so much exciting agency news all the time, I recommend following the Harold Ober Twitter account to see what our amazing authors are doing. Thanks to everyone who entered, and don't forget that we have another Mystery Agent Contest opportunity coming up on October 1st! #MSWL (Manuscript Wish List) Day! About six months ago, a fun idea was brought to the Twitter feed by writer, KK Hendin. The thought was to start a hashtag, #mswl (manuscript wish list), which would encourage literary agents and publishers to share with the Twitterverse their desires for certain manuscripts. What started with one agent, morphed into two, then three, etc. Soon, many major agents were getting on board, describing what they wanted to see in their inboxes. This project was specifically created to alert writers as to what agents are looking for. This is NOT a pitch session. The #MSWL tag should ONLY be used by publishers and agents in the feed when discussing what they want to see - NOT to promote books, or ask questions to agents directly about their interests. 3) If, and only if, an agent mentions it, you can use #MSWL term in your query subject line. Only do this if you are sending a manuscript that might complement an agent's specific interests. If you're not ready to query, this is a great time to scroll the feed and do some research. Check out which agents want historical, or fantasy, and make note of it. Then, when your manuscript is ready, you'll know who to approach. Again, please follow ALL the rules of this event, and take notes, copious notes! It will definitely help you when you query down the line! I've always been a pantser, but there's one story I've been working on for a few years but haven't been able to make much progress on because I couldn't figure out how it would end or even a glimmer of how it might end. So about a year ago I made a goal to plot this story, the whole thing, and prove to myself that I could do it. I've read a ton of books on plotting and tried several different methods, including outlining, writing notes, and building spreadsheets. They've all inched me closer to my goal, but I could never get it organized in a way that really moved me forward. 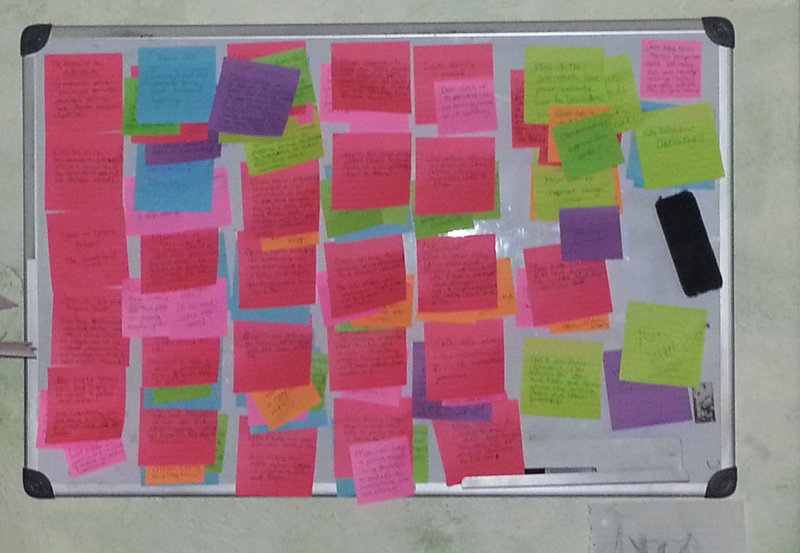 And somehow, in the middle of the absolute busiest week of the year for me, I managed to map out the last two-thirds of this story in one night, after almost three years spent plotting the first third (which was mostly done panster-style by writing scenes). I know a lot of things will probably change between now and when the first draft is finished, but now I have something to work toward. What about you? Are you a plotter or a pantser or some combination of the two? Any methods you can't live without? Open Thread Day: What Are Your "Sorkinisms?" If you've ever watched more than one of snappy-dialogue-enthusiast Aaron Sorkin's works in close proximity, I'll bet you've noticed something... familiar. Well, it's not really stealing if you're stealing from yourself, I guess. But I can't judge Sorkin too harshly. How many times have I looked at a past work of mine and noticed a line of dialogue that's suspiciously similar to something in my new WIP? As in, it's word-for-word the same in both projects? So over to you, OAers. What are your "Sorkinisms?" Instead of one line pitches, our Mystery Agent wants to see the first 250 words of your manuscript! The contest will go live as usual at 10 EST and this time we will be accepting the first 30 qualified entries. So be ready to go when the post goes up! Do not post entries on this post - only entries posted on the official contest post that will go live on October 1st will be counted. We'll see you back here on the 1st! Ever get sucked into something different while you sit around and wait for the publishing industry? Well, that happened to me just recently, thanks to fellow bloggers Angie and Michelle. However, with their insistence and encouragement, I decided to take my little creative endeavor to the next level—and I opened an Etsy shop for these adorable mini-book charms. 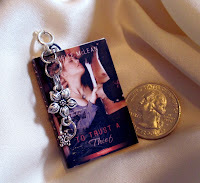 I honestly have no idea how much work I just created for myself, but special thanks goes out to Michelle, Angie, and AJ for letting me play with their covers-- your charms are in the mail! 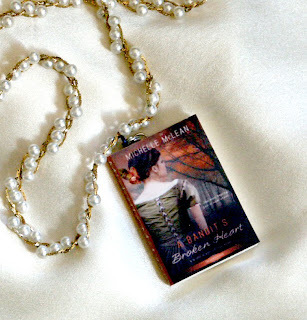 The first thing I want everyone to know is that these charms are ONLY made for authors/ publishers/ designers (not fans) who have permission to use the novel's cover art for marketing swag, etc. 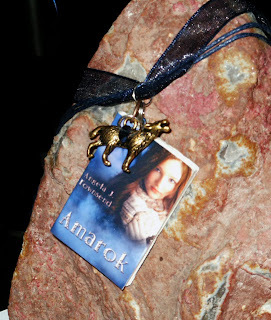 Much like having bookmarks or postcards made for giveaways. Who wouldn't want to show off their book everywhere they go? 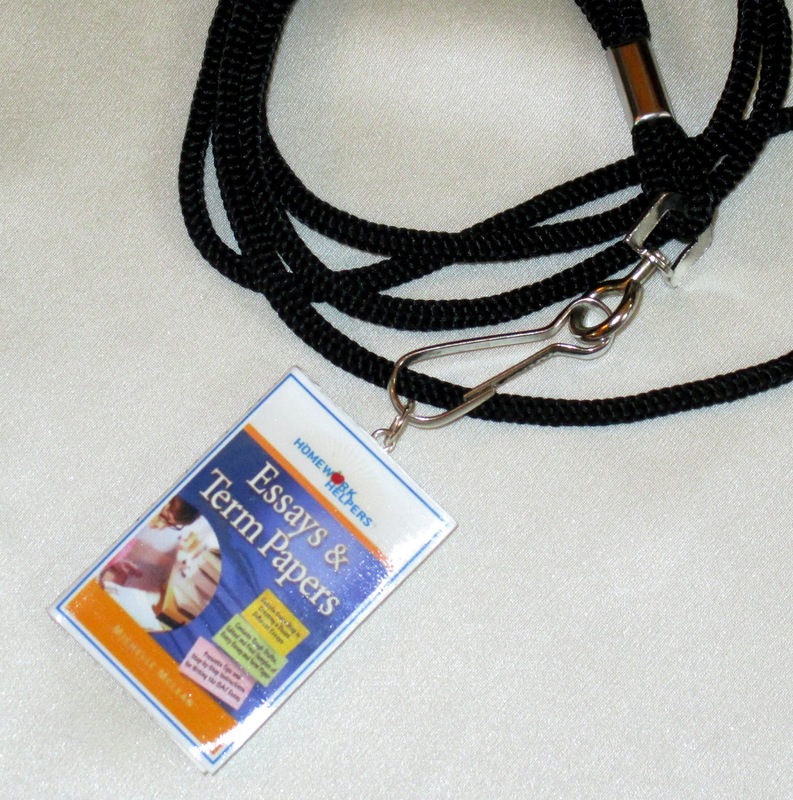 The charms make great jewelry, key chains, handbag/purse charms, ornaments, bookmarks, or lanyard decor for badges at speaking engagements, conventions, book fairs, book signings ... you name it! 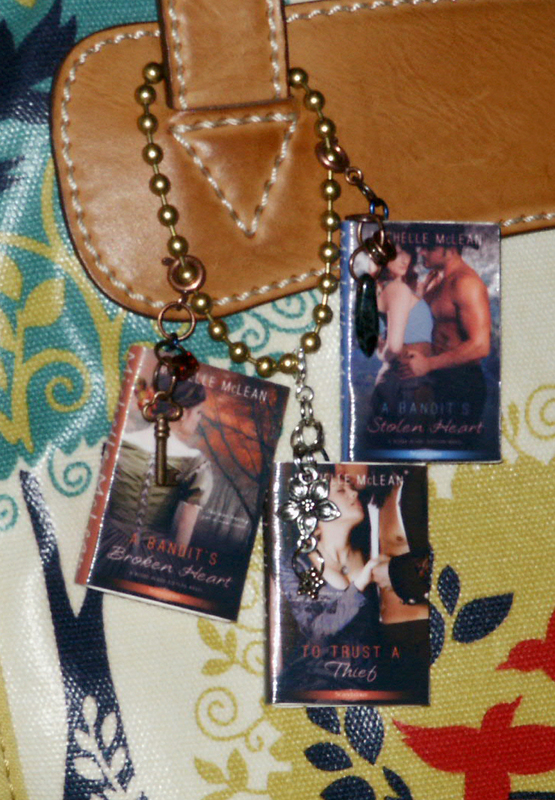 Each charm is handcrafted with YOUR cover art on the front and back. If you don't have a back cover, I'll choose a color from the front and make a blank one for you. I'll also put your name on the spine. 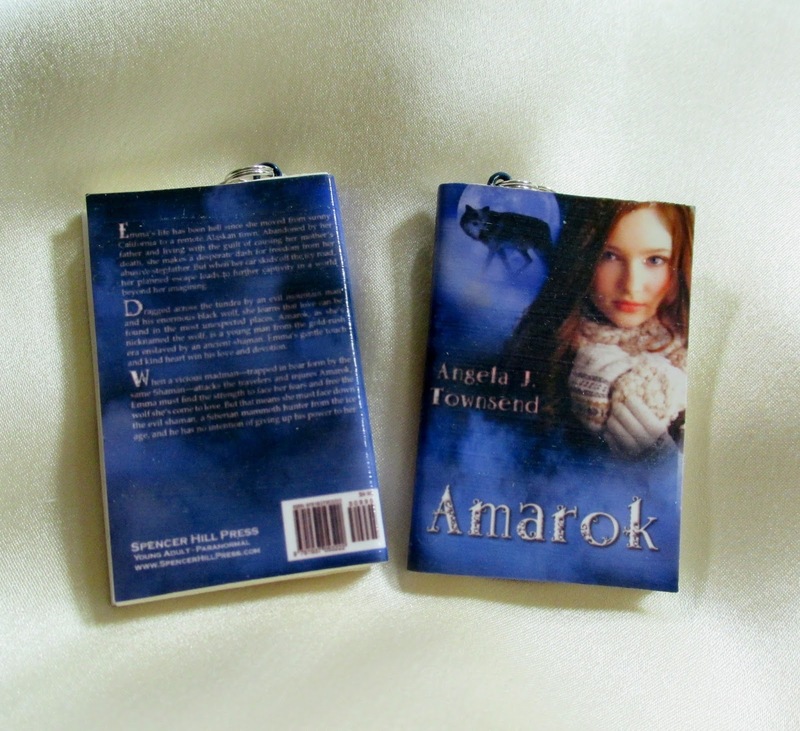 ~Acid-free pages are trimmed and layered to fit the dimensions of your cover. This book does NOT open when finished. 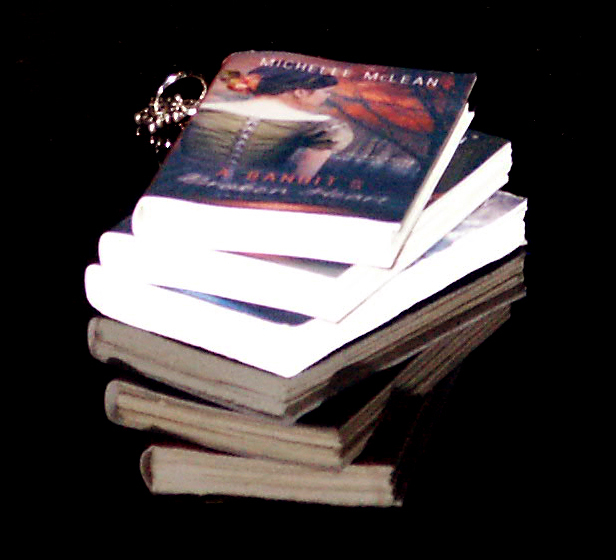 ~High-gloss, color covers are glazed with acrylic gel for protection against normal wear-and-tear and water resistance (it's still paper.. can't be 100% waterproof). ~A small loop is securely embedded within the pages for extra durability. All charms will arrive ready for use, however, there are two variations: A simple charm by itself, or, a charm with extra bling added. 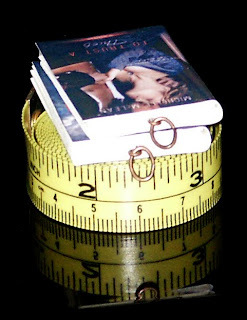 (Bling would be theme charms and/or beads added to the mini-book, and either a ribbon/cord necklace to hang it on, a ball chain, or a lanyard (for you professional business types). I'll offer a discount for volume if you want to keep some on hand for giveaways or merchandise on your website or blog- just ask. Any questions? I'll answer here on the blog. Once again I'm calling for brave souls who would like to get their query critiqued by me (Angelica), and other OAers who will chime in as their schedule allows. Plus, the public can add their thoughts and encouragement in the comments. The Rafflecopter will be open through September 23rd, and the critiqued query will go up on September 30. We need a contact in your entry, but it's okay to disguise your email from bots by formatting it like youremail (at) gmail (dotcom). So if you're up for joining us in this experiment, you must sign up below and then leave a comment telling us what age/genre your book is. This last bit has no bearing on whether you are selected since Rafflecopter does the choosing for us, but it's always interesting to see what you're working on. We will be emailing the winner and announcing their name on Twitter and Facebook on September 24, so it's worth your while to follow those accounts! Being a writer has always been my dream. Guess what? I am a writer. I write nonfiction for my day job, and I write middle-grade fiction as a passion. I've even been published. So why doesn't it feel like a dream come true? Because you can't live a dream. You can only live real life. There are dream-like moments -- getting an offer from an agent, a contract, an award, a bestseller (some of those remains dreams) -- but reality is much more mundane. Big contracts come with pressure and deadlines. So do small ones. So does self-publishing, only the people cracking the whip are readers who demand more. Agents and editors and readers often don't have the same ideas as you do. They don't always like your latest work. There are reviews, returns, and unearned royalties along the way. There are disappointing sales and dropped contracts. There are empty book signings, readings that fall flat, endless blog posts, and internet controversies. Hopefully there is plenty of writing and more books along the way too. Writing can be a good job or bad one. Well paid, poorly paid, or unpaid. It can be a very good life, and I'm grateful for the one I have. But it's always work. So what about the other part of my dream -- a pot of dark-brewed coffee and a thousand words, a long walk on a crisp sunny fall day, another thousand words? That's not real life. That's a writer's retreat. Ceri McKinley never stopped wishing that her ex-fiancé Jason Crickett would come back into her life. But when he finally does, he comes with a request that puts them both--and all of humanity--into jeopardy. Jason only wants two things: to bury his brother properly and to convince Ceri to trust him again after he jilted her. But when Ceri agrees to help him get his brother back, they end up fighting for their lives as the second zombie uprising threatens them all. Seventeen year-old Jonas Norton is trying to come to terms with what his blood disorder has robbed from him, including his two most favorite things: basketball, and competing in Hatchet Racket, Wanless' annual hatchet-throwing contest. The facts that his father works constantly to pay for his blood tests and Jonas can actually see the disappointment in his eyes for being such a failure only make matters worse. And even worse than all of that? Jonas' own twin brother, Micah, is perfectly healthy and becoming quite the basketball player himself. Also, Hattie, the girl Jonas has loved for forever? She has no idea how he feels. Sixteen year-old Hattie Akerman lives down the hill from Jonas. Though her father, Heath, tries to hide his lack of mental clarity behind the bottle and she's pretty much given up on having any kind of relationship with him, she would still rather her younger sister, Lucy, not have to deal with the consequences of his behavior. Hattie helps her mother by baking food to sell at Market and looking out for Lucy. 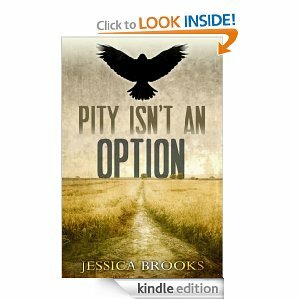 No matter what the rest of the town says about her crazy father, Jonas sticks up for them. He is, by far, her very best friend. As if things aren't complicated enough already, Heath and Micah are unexpectedly drafted into President Kendrick's army (an army from which no one ever returns) just days before Thanksgiving. When Heath disappears instead of arriving at the Meeting Place to check in, Hattie and Jonas decide they've had enough, and take matters into their own hands. And though nothing could have prepared them for what happens next, Hattie and Jonas learn that hope can be seen in every situation. You just have to know where to look. The Sleeping Kings awaken September 27th! September 2013 Mystery Agent Contest!